QUANG BINH (VNS) — Fourteen signs banning illegal sand and gravel mining have been installed in 14 hotspots along the Gianh River in the central province of Quang Binh. Earlier Deputy Prime Minister Hoang Trung Hai asked the provincial authorities to tighten their management of the sand and gravel exploitation along the river. The signs banning the practice were installed on the riverbank which runs past eight communes of Quang Trach and Tuyen Hoa districts where sand and gravel are being mined, changing the river flow and causing environmental pollution. Director of the provincial Department of Natural Resources and Environment Le Minh Ngan said that the sand mining on the banks of the Gianh River and many other rivers in the province was alarming. Earlier, local residents took the sand and gravel for their household construction only. However, the exploitation has increased recently, he said. The department has taken measures to curb the mining and to punish the culprits. So, the situation has "temporarily settled down and will gradually become stable," said Ngan. 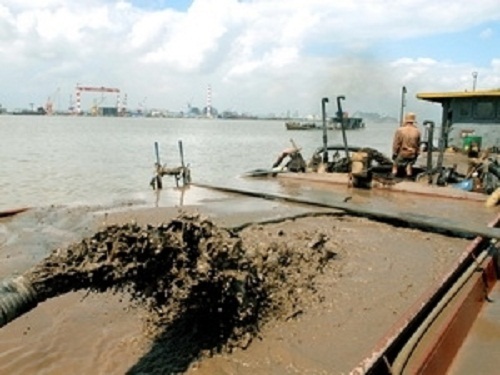 The local authorities have fined the Duc Toan Co Ltd in Tuyen Hoa District VND440 million, or US$20,900, for illegal mining of sand on the Gianh riverbank. It is the highest fine imposed for the violation so far in the province.